Sometimes you go on vacation when you can go, whatever the circumstances are. That is whey we are going to Hawaii over Labor Day weekend, It was when we could go as a family. Unfortunately, we picked the same time as the International Union for Conservation of Nature World Conservation Congress will be happening in Honolulu. People from all over the world will be attending from September 1-10. Well known names such as Prince Albert of Monaco and Jane Goodall will be flying in to speak. Traffic will be a nightmare, we are told. All I can say is, Oh Boy! Then, of course, there is the highly unprecedented weather happening that will occur, starting just as we arrive. Yes, two, not one, but TWO, hurricanes are bearing down on the Hawaiian islands. Excuse me while I go have an anxiety attack. Actually, Oahu should just get rain and maybe some wind, as the paths is curving south away from Oahu.. As far as I can tell it shouldn’t affect our flights. Fingers crossed! One more thing. As if a world wide congress and two hurricanes aren’t enough, President Obama is coming into town about the same time we are. One of our uncles referred to the visit as “Hurricane Obama.” I think we will be heading out of Honolulu for the North Shore for all of our sightseeing. Goodness, we really are flying into the eye of the storm! How about older women? Certain things are not as firm and perky as they once were. I just have visions of reaching for the bread basket and dangling something into the dinner plate…..
On the Bunyadi website the food was called “naked” as well, because it was made “without the use of fire, electricity, or gas.” FYI, that means if you got the non-vegan meals your meat was raw. Vegan, here I come! For those of you craving the experience of the next new thing, I hate to tell you but the naked restaurant was just a pop up and it already closed a couple of weeks ago. Sorry, you will have to find another excuse to shed your clothes next time you are in London! They say the anticipation of vacation is as good for the soul as the vacation itself. I would say that is the case up until about a week before the actual trip. That is when the rubber starts meeting the road and things have to get DONE or else! Well, we have reached that point for our Hawaii trip. First was the suitcase issue. Apparently I buy cheap suitcases that do not like being stored in the heat of the garage attic. The plastic corner inserts in our 24 inch suitcase have disintegrated into confetti rendering the suitcase unusable, as far as I am concerned. Off to the store I went last night to find a replacement. I am happy to report I was able to find a new case which Hubby and I will share. We decided to check one suitcase in order to allow us to bring gels and liquids which are more than three ounces in size. In a humid, sunny climate we will need sunscreen and hair products galore! Then there is the laundry that needs to be done. Getting the house ready for the house sitter. Getting the info, meds and food pulled together for the vet office that will be taking care of Blackie while we are gone. And the list goes on. On top of all that, my fellow local history columnist and I are getting ready to publish our second book of columns. He wants me to finish reading and correcting the whole thing before I go so he can make the corrections while I am gone. Not an unreasonable request, so the whole project doesn’t come to a grinding halt while I am gone. But got to get that done, too. Yes I am looking forward to vacation. No, I am not looking forward to the days leading up to vacation. Blackie was back to not eating much yesterday. We decided he would get an eating pill this morning. Those things really make him chow down, so we like to give them to him when we are around to refill the food bowl a few times. Again, he fools us. He is eating like a little skinny, furry black pig today. Then, a few minutes ago I was sitting right here at the computer and I heard a cat galloping down the hall. I looked up just in time to see a black cat streak by the door to the room I am in. I mean that animal was hauling a**. I half expected to see a lion chasing him, it was that fast. I thought myself, “There is no way that is Blackie, it must be Nox.” But, when I looked over at the window seat, there was Nox, happily looking at the birds outside. What??? 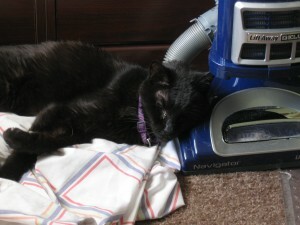 I called Hubby to report the news of the Black Cat Gallop and he said, “Well that is the third time. ” WHAT??? Eldest Daughter confirmed. Blackie already took two runs down the hall during the night. The run I witnessed was run number three in the last 12 hours. Seriously, if you saw skin and bones Blackie you would not expect any running, let alone three hell bent for leather runs in 12 hours. Gosh, that cat likes to keep us on our toes. Those of you who have cats, do you have the same ongoing cat food issues I have? Let me explain. Where I live, we have five grocery stores. Four are Stater Bros., a local So Cal chain, and one is a Walmart Neighborhood Market. Stater Bros. has been cutting back on the number of products it stocks, including my previously mentioned problems when they eliminated the one kind of food Blackie liked as well as eliminating any kind of canned kitten food. After the kittens grew a little older, I fed them primarily dry kitten food. Now that they are adults, I fed both canned (which my vet and other sources says is better for cats) and dry (which is easier to feed and store.) I have no problem finding dry food at my local stores that I want to feed my cats, but wet food is a real issue. The Walmart store isn’t very big, and they carry the same basic line up of cat food all those Stater Bros. carries: Friskies, Fancy Feast, store brand, and a very small assortment of Iams. While I can find all kinds of different brands on the dog food side of the aisle, not so much on the cat food side. In order to access a wider variety of cat food, I have to traipse 20 minutes away to the closest pet food mega store. This is annoying as all get out. It is also expensive. Today, for example, I spent $60 for about a two-week supply of canned food. I have three cats, I admit, and a very picky elderly cat. I also buy the small cans, as they are much more the correct feeding size for my cats and come in a wider variety of flavors than the large cans seem to come in. Folks who have cats, am I being too picky about my canned cat food? Should I just buy Friskies or Fancy Feast for my babies and move on with my life? I have fed the dog food I can get in the grocery store her whole life and she is still going strong physically at 16+. In spite of Blackie’s many issues, he has only eaten “fancy” brands when problems began to crop up, problems not caused by his diet. I had to do a bunch of errands today. They ranged from getting gas in the car to going with a friend to her appointment with a surgeon. Altogether, I made nine stops. One was at Starbucks, so I don’t think it counts. I didn’t have to drive very far for any of it, either. But boy oh boy, my brain is wiped out now. IT is dinner time and I feel like I could call it a night and just go crawl into bed. Send me to a meeting that lasts five hours and has 12 agenda items, and I am OK. Put me in a car, drive me an hour away, walk me around, get me lunch, etc….and I might be a little tired but nothing too dramatic. But break it all up in separate little bits and make me do all the driving, and I am so tired, I can barely stand it. While this is worse than it used to be, I have been this way my entire adult life. Don’t know why. Oh well, I bet I will sleep good tonight, if I can get through some TV watching without falling asleep, that it! Ha ha! Hope your Wednesday was a little less busy than mine! A Facebook friend has family in Alaska. She made an adorable knitted sweater and hat for a great gandbaby up there which she sent at the beginning of the summer. A photo was posted, and my friend commented that it looked like it would fit the adorable baby girl “all summer.” I had to read that a few times. Summer? Sweater? Oh yeah, Alaska! I just discovered it is very easy to get a Spanx like undergarment in small. However, no one who wears a small needs one. Thus, it is very easy to find them in small. It is a vicious circle. NBC failed me. I had one last Olympics show on the Tivo, which I recorded because it was to include some of the rhythmic gymnastics gold medal round. Instead it included a whole lot of Ryan Seacrest doing a whole lot of nothing and absolutely no rhythmic gymnastics. Grrrrr! I was looking back at some blog postings I had started but never finished. One recent one stood out. It was titled “Good Bye to the Condos.” What the heck could that be about? We don’t live in a condo. The few condos around us aren’t going anywhere. I opened it up, looking forward to solving the mystery. Unfortunately, there was nothing written in the draft blog post. It was just a title. A title that will forever remain a mystery…. Oh No! The Olympics are Over! I was not terribly into the Olympics this summer. All the horror stories out of Rip about how they weren’t ready, etc…. just added to my Olympic Indifference. When Hubby and I tired to watch the opening ceremonies that was the night Blackie kept interrupting our viewing (indoor pooping, broken glass) making it hard to get into watching that event. But, on the first night of competition, I did turn it on, with a kind of “oh, what the heck” feeling, and, just like that, we were sucked into the vortex of competition, of success and heartbreak, of gold, silver, and bronze, of Micheal Phelps, Simone Biles, and why oh why those U.S. men can not pass the baton correctly in the 4 x 100 relay….. And so we have watched nothing else during our nightly television watching except Olympics for over two weeks now. Now, today, it is over. Oh no! As it has been for every Olympics for our 30 years of marriage, now comes the terrible Olympics withdrawal symptoms. After tonight, what will we watch? Those darn Olympics, they get us every time, even when we aren’t expecting it! Did you watch the Olympics this year? Will you be experiencing withdrawals as well? We have a cat who is 17 1/2 years old. What is that, 90 or 100 in human years? He has good days and bad days. The last few we could tell he was feeling off, not horrible, but not good. I took him to the vet. There is only so much they can do due to his various chronic but not life threatening issues. I brought him home. I had a serious talk with the girls. We cried a bit. I had a serious talk with Hubby when he got home. As I lay in bed last night I made the mistake of allowing my mind to drift to Backie. I cried a little more. Just when we think Blackie is going down the rabbit hole, as we phrase it, every single time so far he has popped his head back out, with a hungry look on his face. Who knows how many more times that will happen, or should happen. But, at least this morning, he is eating and seems content. So we will take it for what it is worth. Poor Blackie is feeling a little under the weather. We aren’t sure what is going on, but he suddenly cut back on his eating, he has been hanging out in his comfort places some (the places he likes to be when he isn’t feeling well) and his poo turned an interesting color. 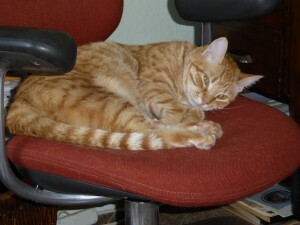 He is off to the vet today to see if there is any thing that can be done. It will probably be a futile attempt to understand what is going on, but, we feel like we have done everything we can at home and the weekend is coming. Honey has, just this week, decided that the bed of sheets that Blackie likes in the computer room is a fine place to sleep when I am pounding away on the keyboard. 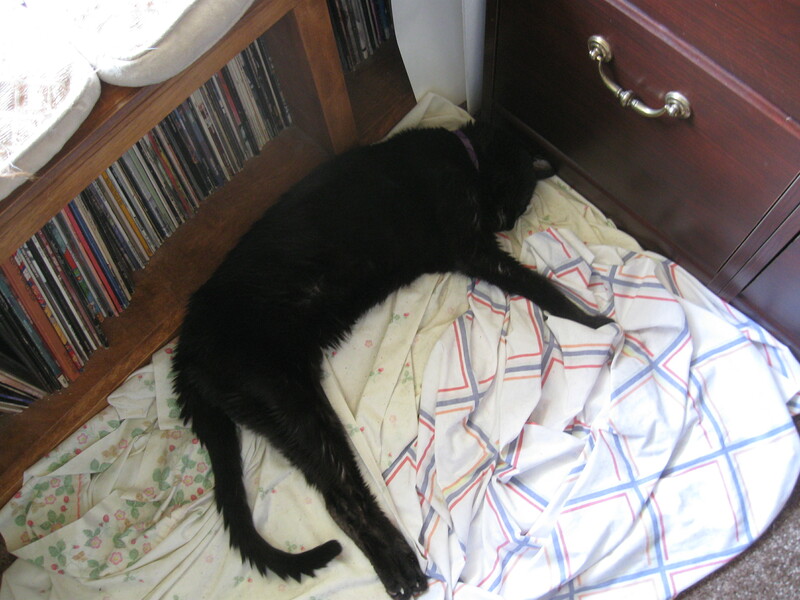 I would feel more sorry for Blackie except that he isn’t using the sheet bed (as we call it) this week anyway. I don’t know what we will do if Blackie begins to show interest in that bed again. It is a small room. The sheet bed is in the only place a pet bed can go without being in the way. The next step would be to cover the entire floor with piles of sheets. What an interesting decorating concept, don’t you think? While we were watching the Olympics last night, we heard some sort of crashing noise. Hearing weird noises is pretty common when you have young, active cats. At that point, we do what we normally do – we paused the TV, we listened for further noises, and we looked for any cats streaking away from the scene of the crime. Hearing no new noises and seeing no guilty cats, we went back to watching TV. This morning I discovered a florescent bulb had been knocked off the shelf in the garage and to the floor. It was shattered of course. So I cleaned it up. It could have been much worse. It could have been something I cared about!